Selecting core materials for aerospace applications presents today’s design engineers with expanding choices and increasing challenges. Since the advent of passenger jet transportation, aircraft OEMs, Tier 1 and Tier 2 companies have sought to increase efficiency and safety, while also decreasing cost. With fuel accounting for up to 50 percent of direct operating costs, fuel efficiency becomes a key driver in the rapid development of advanced lightweight materials. In less than a generation, we’ve seen composite materials go from comprising 10-15 percent of passenger jets to more than 50 percent. Mounting pressures to decrease costs has led to an increase in acceptable materials that fit a specific form and function within the aerospace transport industry. Until 1986, materials were only required to pass a 60-second vertical flame test. Since then, FAA regulations have incorporated horizontal burns and oil burn tests, and within the last few years, smoke and heat release specifications: the 65/65/200 peak heat release, average heat release over time, and optical smoke density measurements. Along with these standards, many OEMs require materials to pass toxicity specifications, meaning all materials must meet the FST/OSU designation. These specifications matter because interior parts represent some 20 percent of the total fire load of an aircraft at landing, which is when most incidents occur. Typically, these specifications apply to large ceiling and wall panels, or structures that cover large areas within the aircraft. These interior parts include acoustic insulation panels, floor panels, partitions, side walls, stow bins and the like. Composite materials comprise about 90 percent of interior furnishings in today’s passenger jets. Because composites are made from a myriad of chemical components, they have the potential to burn in different ways, releasing varying amounts of stored chemical energy. The longer and hotter a material burns and the increasing amount of smoke generated, the greater the risk to passengers and crew inside an aircraft. While many different composite core aerospace materials are on the market, the biggest challenge is satisfying all the requirements for physical properties, safety specifications, environmental impact, design flexibility and cost efficiency. Designing aircraft interiors also requires anticipating next-generation requirements. The recent move in Europe to eliminate all halogen-containing flame retardant materials and chemicals –potential hazards to passengers – signals a global shift to halogen-free, fire-safe materials. Some materials, such as polymethacrilimide (PMI) and styrene acrylonitrile (SAN), have great physical properties but don’t pass FST/OSU testing and will be unusable for next-generation aircraft. On the other hand, a material like polyvinylchloride (PVC) is strong and 65/65/200 heat release and smoke density compliant, but has a low glass transition temperature (Tg) So, it’s often unsuitable for typical aerospace prepregs and adhesives that must stand up to temperatures exceeding 200º Fahrenheit for composite layup panel processing. Others, like polyethersulfone, offer desirable characteristics but it’s hard to justify significantly higher costs compared to polyurethane foams. For some applications, the ability to support heavy loads dictates extremely strong core material. It’s understandable that honeycomb material has been the default core material for composite panels, because of its inherent unidirectional strength and extremely light weight. But when it comes to non-load-bearing applications, it is clearly over-engineered and comes with a huge cost premium due to the time-and labor-intensive process to produce it. And that cost eventually gets passed down to passengers. Recently, it’s become more necessary to incorporate new materials in an effort to create a more cost-effective solution to aircraft design. This has given design engineers the freedom to explore materials that fit a necessary function instead of using over-engineered honeycomb for any application regardless of the loads and stresses that the material actually sees. For 75 years, General Plastics has worked directly with OEMs to develop novel materials and to incorporate new designs into aircraft, helping them achieve cost-effective, low-weight, safe and to-spec materials that contribute to their current and future success. 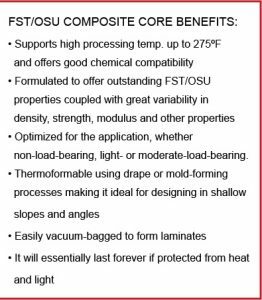 General Plastics’ LAST-A-FOAM® FR-3800 FST is the first polyurethane material to achieve the FST/OSU specification and was developed to meet the industry’s need for a low-cost core alternative that meets FST/OSU properties. Although flame-retardant polyurethanes have been around for decades, some don’t come close to meeting stringent FST/OSU and smoke toxicity requirements. Our FR-3800 FST polyurethane material contains no halogens and it passes the FST/OSU 65/65/200 specification. Unlike other flame-retardant materials that lose key physical properties to gain fire resistance, our foams offer equivalent strength and stiffness to other aerospace-grade foams. They were specifically developed to meet current industry requirements, such as the BMS-8133 specification for aircraft interiors. Contact us to see how you can incorporate FR-3800 FST into your design.